By 1911, Mathew had died and Margaret lived at Evenwood Gate. All the sons worked as coal miners. Joseph Hutchinson enlisted at Bishop Auckland and appears to have joined the North Staffordshire Regiment being given the regimental number 48308. At a later date he joined the 9th Battalion, the Manchester Regiment and was given the regimental number 53318. 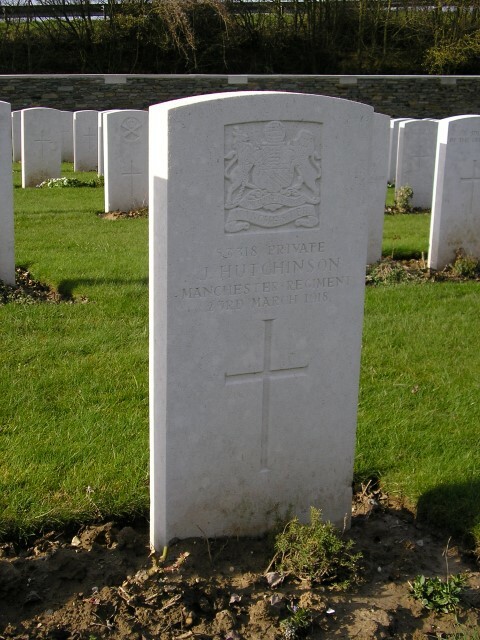 The service details of Private J. Hutchinson have not been examined therefore the date he was transferred to the Manchester Regiment and the date he entered France remain unknown. The 66th Division formed part of the 19th Corps of the Fifth Army and were involved in the Battle of St. Quentin 21 – 23 March 1918. The War Diaries of the 9/Manchesters have not been examined so the circumstances of his death also remain unknown. The immense German attack on the 21st March 1918 enjoyed a numerical superiority of 56 Divisions against 16. German superiority was overwhelming. 21 March 1918: 4.40am: Heavy German artillery bombardment on the British front held by the First, Third and Fifth Armies. The main weight of the attack was between Arras and a few miles south of St. Quentin. Thick fog in the morning. 7.00am and 9.40am: German infantry began to attack. Enemy pushed quickly through the Forward Zone but is temporarily checked at Villeret by 2/6 Manchester. Hargicourt held by 4/East Lancs. lost by 10.30am. HQ of 2/8 Lancashire Fusiliers was captured. Noon: The Germans captured the Fifth Army’s Forward Zone. Those troops that had been holding this zone were mostly lost, either killed in the bombardment or by the advance of the enemy infantry. Those taken prisoner would have been surrounded as the Germans advanced quickly, unseen in the fog. Severe fighting continued between Grand Priel Wood and Templeux-le-Guerard. 2/7 Manchesters defended Brosse Wood for several hours and 2/6 Manchesters did the same at Fervaque Farm near Villeret until a flamethrower attack at 1.30pm. Enemy pushed on but outran its own artillery cover and was halted on the Jeancourt-Hargicourt road. To the north the German attack reached Templeux Quarries which held on until 5pm. XIX Corps reinforced by 1st Cavalry Division. The German advance continued into the 22 and 23 March and the 66th Division suffered heavy casualties which resulted in the Division being reduced to a training cadre, 9 April to 18 September 1918 then it was reformed and reconstituted. Private Joseph Hutchinson was killed in action 23 March 1918. Later research records that between 21 and 24 March 1918, the 9/Manchesters lost 5 officers and 74 Other Ranks killed in action or died of wounds. 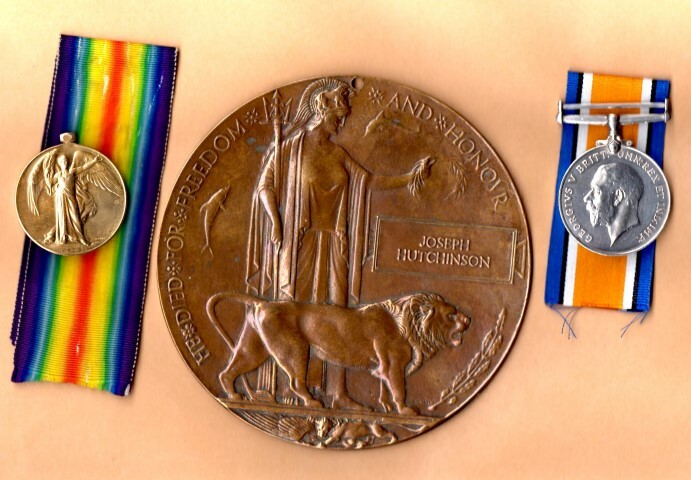 Private J. Hutchinson was awarded the British War and Victory medals.